I expect to feel content after a lavish spa treatment. But when I leave a restaurant with a grin and a glow, the bliss can linger for days. When it happens on consecutive visits to Wildfish Seafood Grille, I know I’m hooked. Always an astute, stylish player with a discerning Newport Beach following, Wildfish is in peak form as it approaches its fifth year. Enthusiasm flows like a current connecting the confident kitchen, polished staff, and merry diners. The lithe space, with its dark woods, oval bar, and cobalt-blue accent lighting has all the settings for a business meal, carefree dinner, or fine drink and lush bite at the raw bar. Executive chef Arturo Briones freshens the solid selection of elite seafood and steaks just often enough to finesse the seasons and give regulars a reason to stray from their favorites. Try as they might, the well-versed servers can’t always lure fans from deservedly popular dishes such as Atlantic lemon sole in Parmesan crust; Chilean sea bass, steamed Hong Kong-style; or crab cakes so meat-laden they barely hold together. Those cakes are indeed superlative, improved only by a swipe of gutsy rémoulade and a sip of Central Coast chardonnay. Venture beyond the familiar starters and the rewards are still plentiful. Tartare of ruby-pink Pacific ahi, creamy avocado, and citrus flesh bursts with a richness that’s perfect for piling onto crisp triangles of house-made sesame lavosh. It arrives composed and colorful—until our waiter deftly chops the pretty picture into a dazzling jumble. Sizzle-your-own Wagyu beef on a hot rock, ishiyaki-style, is a tasty renegade choice; slowpokes needn’t hurry since cooling stones are readily swapped out for hotter reinforcements. Of the soups and salads, the iceberg wedge salad and the wonton soup are shoo-ins. Maytag blue cheese-and-buttermilk dressing complements crisp lettuce, bacon, red onion, and tiny tomatoes for a classic early act. Chubby wontons filled with crab and shrimp bob beside shiitake mushrooms in a steaming broth scented with ginger and sherry. Hot goat cheese salad with wild mushrooms and bitter greens sounds better than this gooey salad actually tastes. Lobster bisque doesn’t stint on cream or meat, but lacks a concentrated lobster essence. A dozen or so seafood entrées anchor the menu, with a few nightly specials for added oomph. Alaskan halibut, the special one night, deserves mention because it’s likely still available and because the snow-white filet gets thoughtful treatment. A light dusting of flour and a quick sauté leaves some golden edges on tender roasted flesh that’s both moist and soft-flaky. Lemon-butter sauce and juicy grape tomato halves let the halibut’s clean, meaty flavor stay front and center. Lemon, butter, and garlic play background to the long, thin lemon sole filets, crunchy in a savory Parmesan crust and set off by a spunky herb salad. Roasted sea bass doesn’t arrive crisp as billed, and garlic and scallions don’t quite wake up its white wine broth. Entrées focus so tightly on what they call the “top of the catch” that it’s easy to go hook, line, and sinker on seafood and overlook the four steaks. Don’t. The two USDA Prime, dry-aged cuts from Chicago’s famed Allen Brothers—a 16-ounce New York strip and the 22-ounce bone-in rib-eye—are as hearty and fine as you’ll enjoy anywhere. And to maintain the LDL festival, consider adding the side of scalloped potatoes with its roof of bubbling cheeses. I rarely take leftovers home, but I was all too happy to have these spuds with eggs the next day. 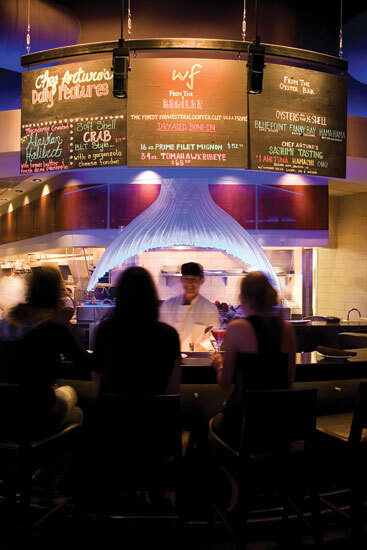 As commendable as the fare is at Wildfish, it’s smoothly matched by classy, accommodating hospitality. The perceptive team deserves a special shout-out for service that’s expert but not stuffy: They make a difficult job look easy. Desserts rank with the kitchen’s top dishes. Chocomaniacs usually insist on the Godiva molten cake. This leaves the best for the rest of us. Berry cobbler boasts flaky pastry and luscious fresh fruit that isn’t thickened to a syrupy sweet. And, oh, the transporting pineapple cake. Roasted, juicy fruit atop fluffy butter cake opens with tropical undertones that evolve to pure wonderment when paired with velvety butter pecan ice cream. This palate-teasing performance will haunt your dreams. When our smiling waiter holds the door as we exit, I feel that warm glow of contentment taking hold. No spa can match this bliss. If that’s taking the bait, reel me in. Crab cake, ahi poke, wedge salad, halibut, lemon sole, New York strip, scalloped potatoes, pineapple cake, berry cobbler. The upper tier behind the bar for privacy; the leafy patio for alfresco fun. A nifty, thrifty happy hour from 4 to 7 p.m. daily, and all night Sunday and Monday. Selected wine and drinks, $6; most appetizers half-price. In the mood for oysters Rockefeller, chef Briones’ adored bread pudding, or something else you don’t see on the menu? Just ask or call ahead and your wish will most likely be granted.